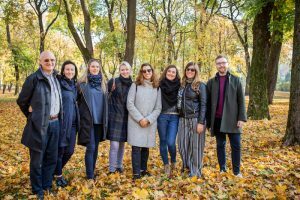 Kaunas Biennial announces curators and concept for its 12th edition titled AFTER LEAVING | BEFORE ARRIVING to take place from June 7 to September 29, 2019 in Kaunas, Lithuania. The exhibition embraces the co-curation approach and entrusts its journey to a team of five emerging and international curators: Elisabeth Del Prete, Daniel Milnes, Lýdia Pribišová, Neringa Stoškutė, and Alessandra Troncone, together with consulting curator Lewis Biggs. For its 12th edition, Kaunas Biennial explores the journey as a metaphor in the context of the burgeoning cultural identity of a city with a complex past. Over the course of recent history, Kaunas has been caught in a state of political flux, transitioning from one regime to the next. Even during its prosperous twenty-year phase as capital city after the Polish annexation of Vilnius between 1919 and 1940 Kaunas remained in waiting, set to regain its status as second city after the liberation of the former capital. What followed, however, was occupation by the Soviet Union, then Nazi Germany, reoccupation by the Soviets, and finally the declaration of Lithuanian independence in 1990 with the country becoming a member state of the European Union in 2004. This chain of events restored not only Lithuanian national sovereignty but also the status of Kaunas as second city with the stubborn moniker “temporary capital”. This perpetual change has shrouded the city in a collective amnesia fuelled by discrepant lived experiences across the different generations. Now, looking forward to its tenure as European Capital of Culture in 2022, Kaunas seeks to carve out a unified path to the future on its own terms, mythologizing its troubled past in order to write new narratives for the present. AFTER LEAVING | BEFORE ARRIVING takes the story of Kaunas as its point of departure to examine broader notions of passage, transition, reorientation and repair in the context of individual experience and intergenerational structures. The exhibition reflects upon how the feeling of disorientation underlying contemporary existence globally intertwines with the specific socio-political realities of nation-building in the New East, where alternative European alliances are unfurling from the knots of past regimes. Alongside these historical and geopolitical narratives, the exhibition looks to more poetic strategies of depicting or perhaps overcoming the condition of precarity, with the absurd, the mystical, and the humorous serving as key tools for navigating uncertain terrain. AFTER LEAVING | BEFORE ARRIVING understands these liminal moments not just as an occasion for contemplation, anticipation, and doubt, but also as a call to action–both individual and collective–in the search for one’s place within the universe. Known for reinventing itself for every edition, Kaunas Biennial has announced an open call and formed a group of international curators, advised by a consulting curator Lewis Biggs (United Kingdom). 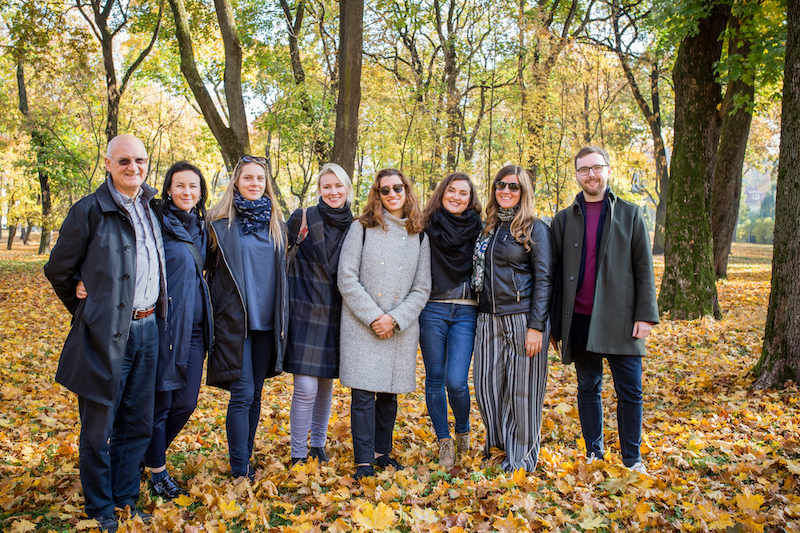 The team to embark on this journey includes Elisabeth Del Prete (Italy / United Kingdom), Daniel Milnes (United Kingdom / Germany), Lýdia Pribišová (Slovakia), Neringa Stoškutė (Lithuania) and Alessandra Troncone (Italy). The task for the group is both demanding and rewarding: to offer an exploration of the nexus between location and identity, an innovative approach to the complex topics of history, collective memory, facing the past and embracing it to better the future. The experience of Lewis Biggs is an invaluable asset to Kaunas Biennial, enabling the biennial’s edition of 2019 to make the best use of the concept of co-curation. According to Mr. Biggs, “a different work method in Kaunas Biennial brings different perspectives. This time, curators have to work collaboratively. Co-curation brings together different points of view, different understandings of what is significant in different countries and cultures. Internationality and trans-nationality nowadays are very important: we live in a global world, whether we like it or not, which means embracing multiple perspectives. Dialogue is fundamental to learning, and the process of co-curation offers dialogue on several levels – between the members of the curatorial team, between the team and the artists, between artists and audience, between the international and the local – to the benefit of all participants”. The title AFTER LEAVING | BEFORE ARRIVING is also a very exciting aspect for Mr. Biggs, as “it is very inviting, allowing the artist and the public to imagine what happens at a moment of transition, when things are changing. On the individual level, there is an opportunity for personal reflection. But there’s also space for reflection on politics or migration”. The team of curators assembled to address this fluctuating state and its various nuances consists of talented cultural operators whose competences will complement one another. Lewis Biggs is an international curator and researcher, Distinguished Professor of Public Art at the University of Shanghai, and a Trustee of the Liverpool John Moores Exhibition Trust, the International Award for Art Criticism and the Institute for Public Art, of which he is the Chair. He was the British Commissioner for the Sao Paulo Biennial in 1986. In 1987, Biggs joined the Tate, and served as Director of Tate Liverpool (1990 – 2000). In 1998, he was a founding trustee of the Liverpool Biennial, and was Chief Executive and Artistic Director of this Biennial from 2000 to 2011; he has been commissioning art for public spaces in a regeneration context since 1998. Biggs has also been co-curator for the 2013 Aichi Triennale, Nagoya / Japan. He curated the 2014 and 2017 Folkstone Triennials and remains curator for the 2020 edition. He was also Curator of Land Art Mongolia Biennial 2018. Elisabeth Del Prete works as Learning Curator at UP Projects, a public art commissioning organization based in London. Elisabeth Del Prete’s curatorial research focuses on collaborative and participatory art practices with a specific interest in socially engaged and public art. Daniel Milnes is an assistant curator and publication manager on projects for Hamburger Bahnhof – Museum für Gegenwart – Berlin, with a background in modern languages, history and art that he gained during his studies in England, Germany and Russia. Lýdia Pribišová is a curator and art historian based in Bratislava. Since 2006, she is the Slovak editor of Flash Art Czech & Slovak Edition and managing editor since 2015. She is experienced in project coordinating and curating, also holding a PhD degree that she earned at the University La Sapienza in Rome. In 2016, the Postmedia Books published her book La Quadriennale di Roma. Da ente autonomo a fondazione [Quadriennale of Rome. From Public Body to Foundation]. She is also a member of AICA – International Association of Art Critics. Neringa Stoškutė is a freelance curator and PhD candidate at the Faculty of Arts in Vytautas Magnus University, and her well-rounded education in the UK covers the areas of art, design and curating. She joined Kaunas Biennial in 2013, starting as a volunteer, and later managing audience development. She has recently been appointed as project manager and emerging curator of the Creative Europe Platform project MagiC Carpets, responsible for the overall management of the platform and residencies of emerging artists in Kaunas. Alessandra Troncone is an art historian and curator. She is currently the artistic co- director of Underneath the Arches, a program for contemporary art that takes place at the archaeological site holding the remains of Acquedotto Augusteo del Serino in Naples, and a professor of Art History at the Academy of Fine Arts in Catanzaro. She earned her PhD in History of Art at Sapienza University in Rome in 2012 and authored the book La smaterializzazione dell’arte in Italia 1967-1973 [The Dematerialization of Art in Italy 1967-1973], published by Postmedia Books in 2014. She is also a member of IKT – International Association of Curators of Contemporary Art. From its humble beginnings in 1997, each Kaunas Biennial is developed from scratch, i.e. by changing its structure, terms of participation, type, place and concept of exhibition, inviting new partners, curators, artists, and other art operators to bring art into focus as a powerful and transformative force. Thanks to this approach combined with integrity and faithfulness to its principles, it is the most popular contemporary art festival in the Baltic Countries, a member of “International Biennial Association” and “Biennial Foundation”, and has secured for itself a place on the map alongside other important art biennials. Each year, the team of organizers strives for Kaunas Biennial to remain a significant and relevant event within the context of Kaunas, Lithuania and Europe, reacting to the processes taking place in the world, innovative art practices, relying on creative collaboration and openness as integral to art creation and its perception. Since 2017, Kaunas Biennial has been the leading organization for Creative Europe Platform project MagiC Carpets, which unites 13 organizations, based in 13 different European Union and candidate countries (Lithuania, Latvia, United Kingdom, Ireland, Italy, Portugal, Czech Republic, Serbia, Georgia, Romania, Croatia, Austria, Germany) (www.magiccarpets.eu).